I am not against eating out once in a while but there are times when you enjoy a dish in a restaurant but also feel that it was something so simple that you could have prepared it at home…with a little help. That is exactly how I intend to do with my recipe for a homemade Naan. Naan is the most popular bread in Indian restaurants. Traditionally, they are cooked in a tandoor (hot clay) oven. 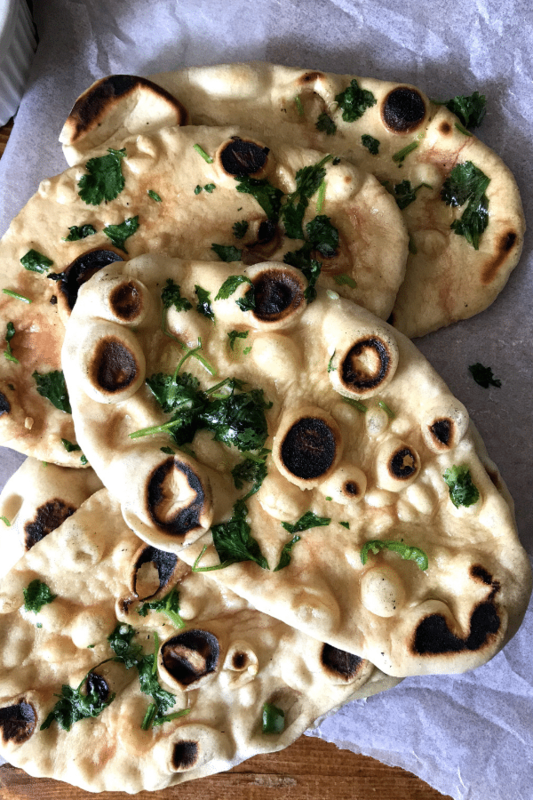 I am sharing a recipe for a tawa naan that is much easier to prepare and you do not need to buy a special oven for this. Tawa Naan turns out the soft and it tastes just as the as restaurants or perhaps a little better by not being as greasy as restaurant food. 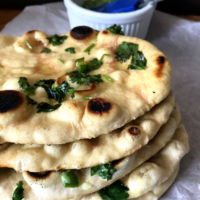 For this recipe, I used Tawa aka iron skillet to cook the Naan but you could also use a non-stick pan. As you flip the naan when you cook, I kept the skillet away from the heat to let the Naan cook a little slower at the beginning. 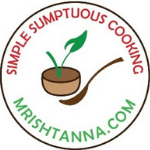 (for this method check Manjula’s kitchen). If you are using the electric range, as I did, check my step by step directions to see how I managed to do it. 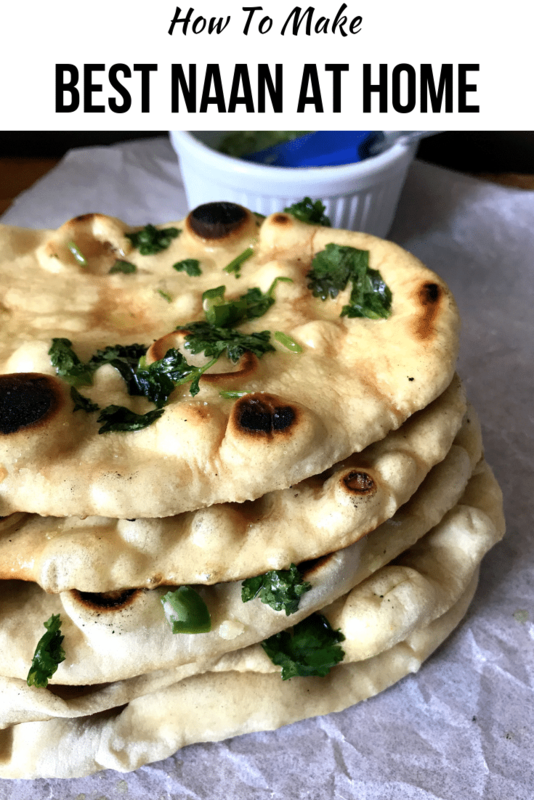 Naan is typically served with a dish with a creamy gravy like Chole curry or Palak-tofu. It is also common to serve Naan over the hot and spicy vegetable pickle. 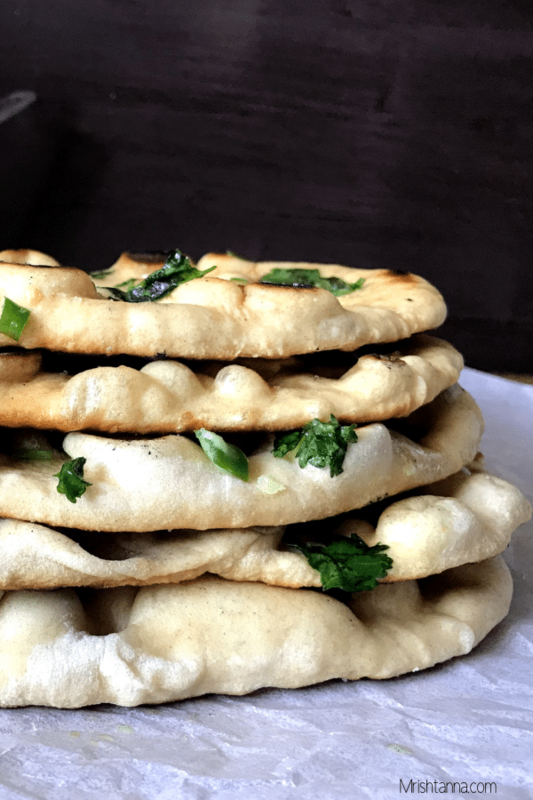 For this reason, it is typical to go light on the salt in the dough because it will be made up in a pickle or the side dish that you serve Naan with. Naan has a pretty good shelf life if they are kept dry and frozen. Some of my friends store them for 3 months, but I try not to go over 4 weeks. Just be sure to roll them in parchment paper before you throw them in the freezer. No yeast, no curd, no butter. That is how I like to prepare Naan. Instead of curd, I used almond milk and apple cider vinegar and I included a pinch of baking soda to the flour. The result is an amazingly soft dough that rises like bread. If this recipe interests you, look for similar recipes in my blog such as the Gobi paratha. For more delicious vegan recipes such as this sent directly to your inbox, just subscribe to my newsletter. You will also get a copy of my e-book where I have put together some simple vegan dessert recipes and dessert essentials. My readers have found it very helpful and I am hoping you will too! 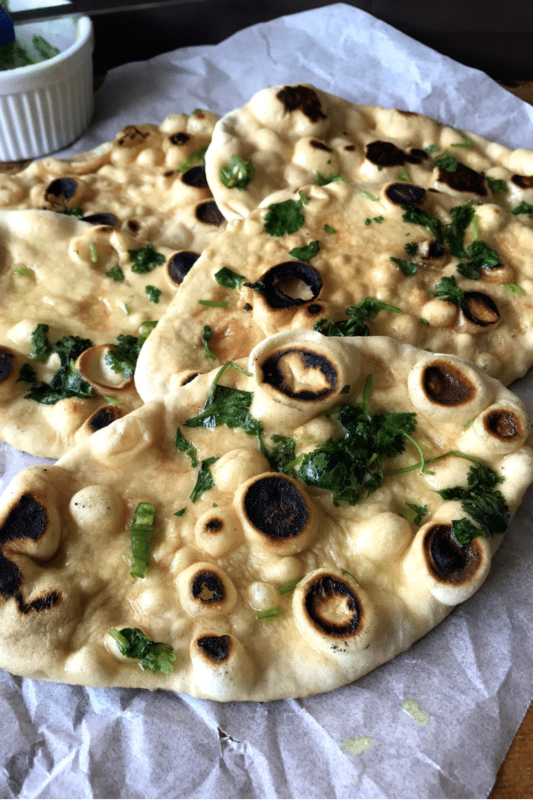 Naan is typically served with a dish with a creamy gravy like Chole curry or Palak-tofu. Mix all the dry ingredients and add vinegar mixture and mix well. Then Add warm water little by little to make the soft dough less sticky. Knead the dough on a lightly floured surface and apply a thin layer of oil on the surface before you let it sit for 2-3 hours. Be sure to cover the dough with a cloth. After the dough rises, knead it again, and divide it into equal parts, I got 6 balls of dough. 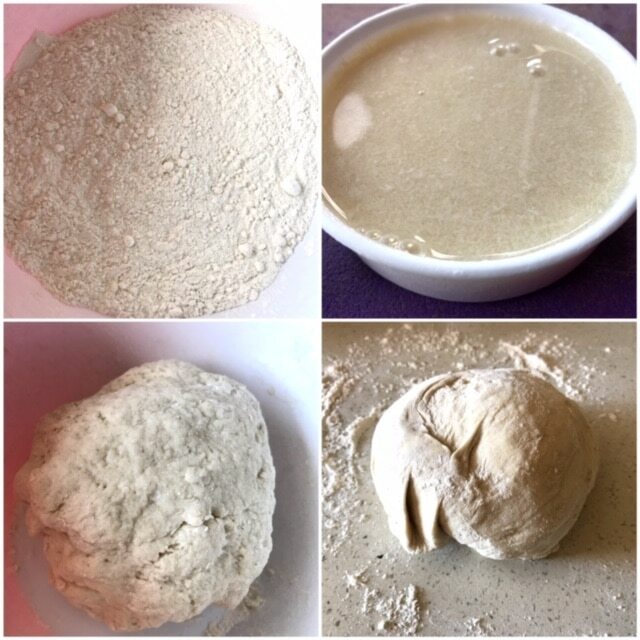 Roll the naan one by one on a floured surface into an oval shape less than ¼ inch thick. To prepare the garnish, mix the following ingredients and place it aside: Oil, Salt, Cilantro, and Green Chilies. Heat an iron skillet over medium heat. After the skillet is hot, place the flatbread dough and cook until bubbles rise on top. Now, flip them on to the other side and cook until you see golden brown spots appear on the Naan. Spread a thin layer of vegetable oil spread over the naan and garnish the seasonings over it. Vegan tawa naan is ready! Mix all the dry ingredients and add vinegar mixture and mix well. Then Add warm water little by little to make the soft dough less sticky. Knead the dough on a lightly floured surface and apply a thin layer of oil on the surface before you let it sit for 2-3 hours. Be sure to cover the dough with a cloth. After the dough rises, knead it again, and divide it into equal parts, I got 6 balls of dough. 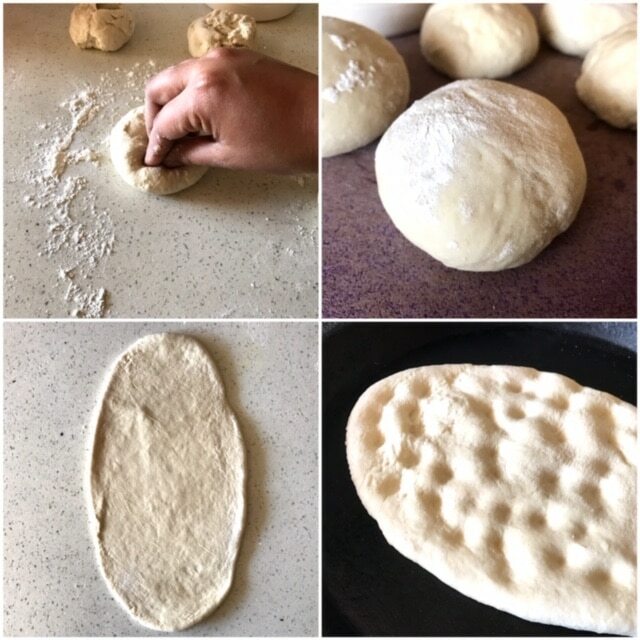 Roll the naan one by one on a floured surface into an oval shape less than ¼ inch thick. To prepare the garnish, mix the following ingredients and place it aside: Oil, Salt, Cilantro, and Green Chilies. Heat an iron skillet over medium heat. After the skillet is hot, place the flatbread dough and cook until bubbles rise on top. Now, flip them on to the other side and cook until you see golden brown spots appear on the Naan. Enjoy Homemade Naan warm with your favorite gravies like Matar tofu, capsicum tofu.